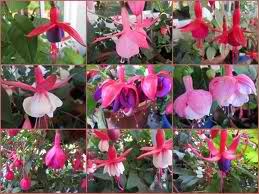 Home / Fuchsias / Fuchsias - Basket/Shrub Varieties / Fuchsia "CRIMSON BEDDER" Variegated (Tom West). Fuchsia “Crimson Bedder” also known as ‘Tom West’ – Single Basket Variegated: 4 petals to the corolla. Crimson,bronze+white foliage. Red sepals. Purple corolla. Very nice variegated foliage. Feature plant. Can be grown as a hedge. Gift Pack Bundle – Excellent gift idea!